Brain Fog is a nightmare for fibromyalgia sufferers. It impairs their life and is seldom believed by doctors, coworkers, friends and family. We now have the proof. It is due to an abnormal cerebral blood flow! A new study has shown a decrease in cerebral blood flow in fibromyalgia sufferers during mental arithmetic processing when compared to non fibromyalgia sufferers. We say "may have" because a confirmatory study is still necessary. This is a great advance in knowledge on fibromyalgia and a further proof that it is a true disease. Furthermore, not only does it show a general decrease in cerebral blood flow but also a greater one on the left side of the brain compared with the right side. This is baffling and theories will abound. 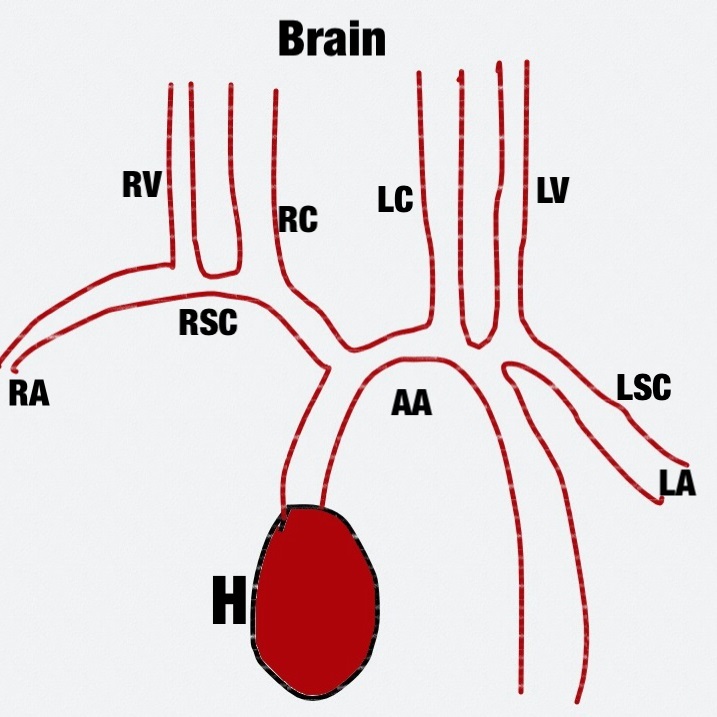 The brain gets its blood from 4 arteries. The two carotids, RC and LC, and the two vertebrals, RV and LV. The right carotid is the closest to the heart and will receive preferential blood flow in case of decreased blood flow. H heart, AA aortic arch, RSC and LSC right and left subclavian arteries, RC and LC right and left carotid arteries, RV and LV right and left vertebral arteries, RA and LA right and left arms. We think that it may be a phenomenon known as "stealing". This phenomenon usually described as "subclavian steal syndrome" is marked by a decreased blood flow in the arm and a retrograde steal of blood flow at the expense of the brain to compensate for the left arm. One of the marker is a decreased blood pressure (BP) in one arm when compared to the other arm.It is also marked by fatigue like in brain fog as well as loss of balance & falls. In fibromyalgia, this seems to happen under brain efforts to compute with a preferential blood flow to the right side. In the situation of a poor circulation, like in fibromyalgia, the first artery to the brain, the right carotid artery gets preferential blood flow when the left carotid artery which is born from the aorta after the right one gets less blood flow ! This situation is even more possible when one remarks that in both situations, the "subclavian steal syndrome" and fibromyalgia the Raynaud's phenomenon is common. Raynaud's is a phenomenon whereby the fingers or the toes become white and blanched under cold or stress conditions. 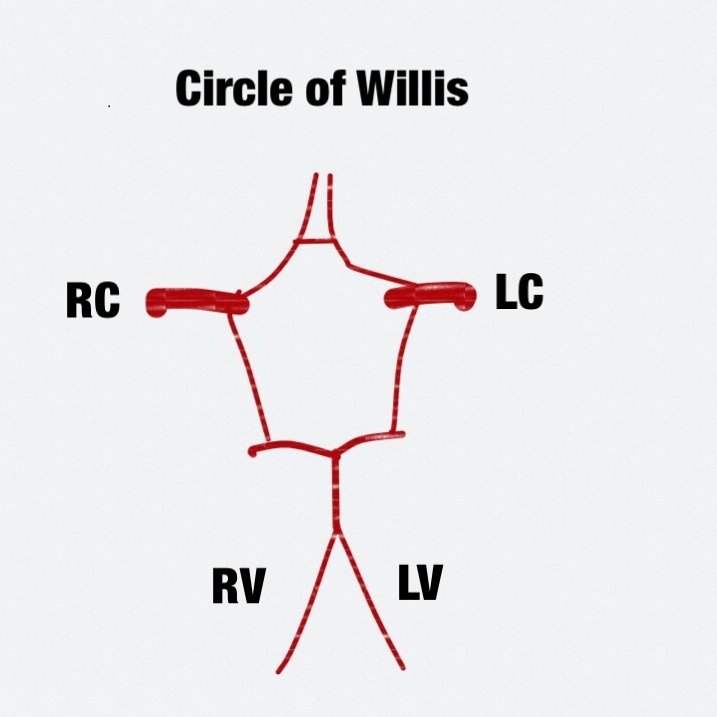 At the base of the brain there is an arterial structure of communicating arteries known as the circle of Willis. This allows the brain to receive blood flow from its four supplying arteries RC, LC, RV, LV and compensate partially or fully from a deficient artery. Another proof for fibromyalgia ! Lastly, we would like to point out that this phenomenon of a decreased blood flow when the brain needs more, like in arithmetic processing, not only proves the poor circulation of fibromyalgia sufferers but also is a further argument for the origin of fibromyalgia: A Muscle Cell Disease ! Aberrant Cerebral Blood Flow Responses During Cognition: Implications for the Understanding of Cognitive Deficits in Fibromyalgia. Montoro CI, Duschek S, Muñoz Ladrón de Guevara C, Fernández-Serrano MJ, Reyes Del Paso GA.
responses during arithmetic processing in FMS patients and its relationship with performance. The influence of clinical factors on performance and blood flow responses were also analyzed. Method: Forty-five FMS patients and 32 matched healthy controls completed a mental arithmetic task while cerebral blood flow velocities in the middle (MCA) and anterior (ACA) cerebral arteries were measured bilaterally using functional transcranial Doppler sonography (fTCD). Results: Patients' cognitive processing speeds were slower versus healthy controls. In contrast to patients, healthy controls showed a pronounced early blood flow response (during seconds 4-6 after the warning signal) in all assessed arteries. MCA blood flow modulation during this period was correlated with task performance. This early blood flow response component was markedly less pronounced in FMS patients in both MCAs. Furthermore, patients displayed an aberrant pattern of lateralization, with right hemispheric dominance especially observed in the ACA. Severity of clinical pain in FMS patients was correlated with cognitive performance and cerebral blood flow responses. Conclusions: Cognitive impairment in FMS is associated with alterations in cerebral blood flow responses during cognitive processing. These results suggest a potential physiological pathway through which psychosocial and clinical factors may affect cognition. (PsycINFO Database Record (c) 2014 APA, all rights reserved).